Back to sleep and woke again at 2.30ish and managed a further little sleep until just after 3am. At which point I knew from previous trips I wouldn't get back to sleep and went out and sat on the balcony taking in the view. It was so peaceful, not a single person around, you could hear the birds tweeting away and the wildlife in the lake splashing every now and then. Last night we had collected our refillable mugs and filled them with some drinks so I sat and had my fruit munch Minute Maid lemonade light just enjoying being here. 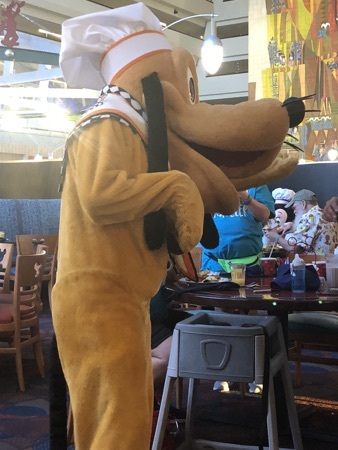 Knowing we would be up early this morning I had managed to secure a reservation for chef mickeys at 7am. 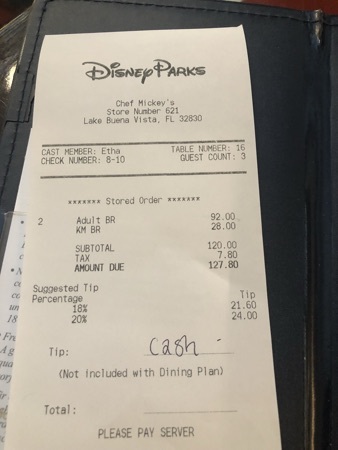 Dd loves it here and while I wouldn't pay the ridiculous price in cash I do actually really like it here and it's a great use of a dining credit. 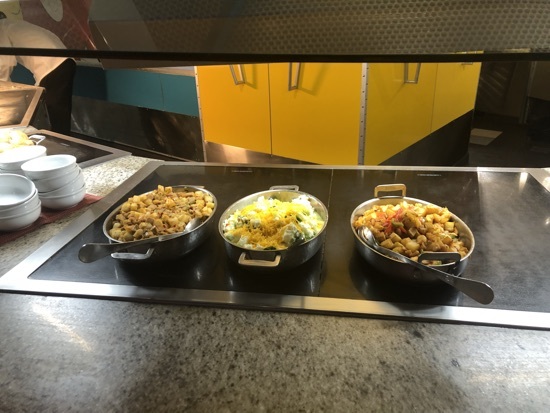 We decided as we were checking out and moving to copper creek later we would take some of our cases to the car when we went for breakfast to make things easier later, we left around 6am and drove over to the contemporary resort and were the first to check in at chef mickeys. 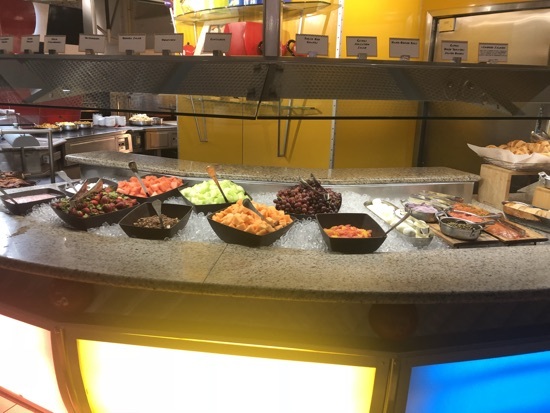 We were the first seated of the day which enabled me to get some pictures of the buffet before it was trashed with people eating  our server brought us all arrange juice and coffee for DH and I, chocolate milk for DD. 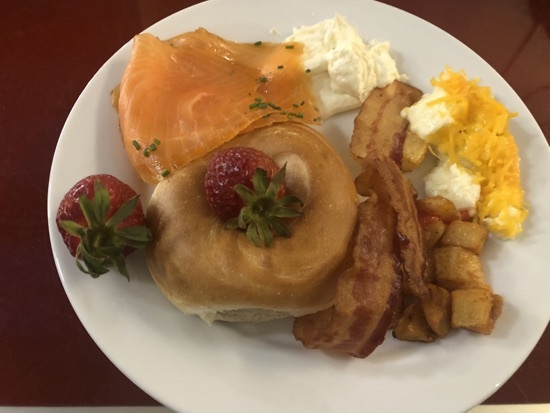 First plate I got a bagel, cream cheese, smoked salmon, bacon and some cheesy scrambled egg whites and a couple of strawberries. This was all so tasty especially the bagel with smoked salmon and cream cheese. 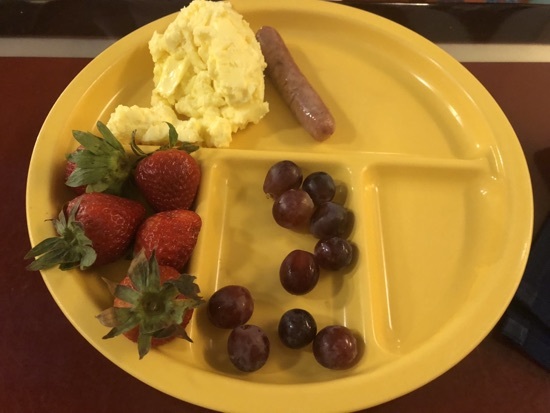 Dd got some strawberries and grapes, scrambled eggs and sausage. She also had some tater tots but these are her absolute favourites so they disappeared immediately! 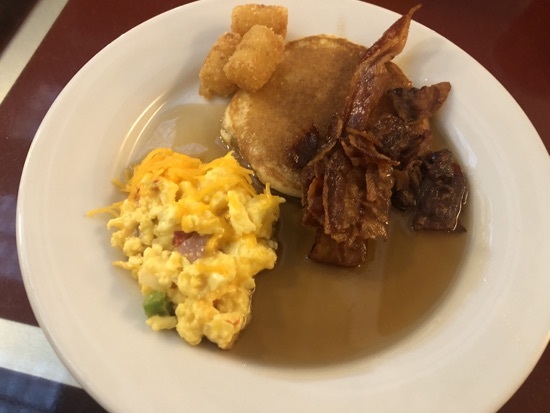 Next up I had a pancake with maple syrup, bacon, tater tots and some western scrambled eggs. All of this was really good too, it's definitely worth getting a reservation first thing as the food is all fresh and hasn't been picked through. We saw Minnie, Mickey, Donald, goofy and Pluto and they took their time to have plenty of photos with each table which was nice. 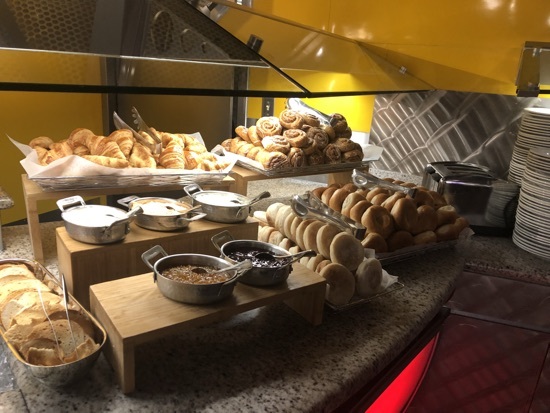 The dessert options were mostly pastries as you would expect for breakfast. 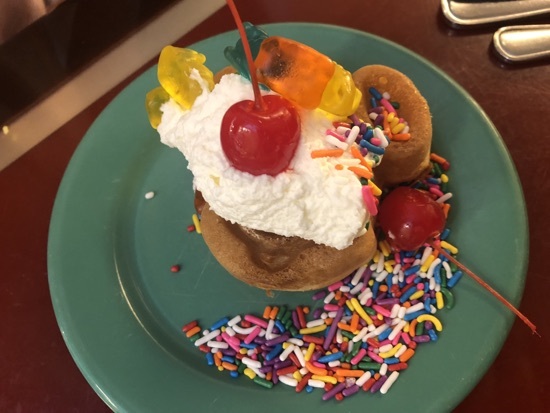 Dd had a Mickey waffle with whipped cream, sprinkles, cherries and gummy sweets. 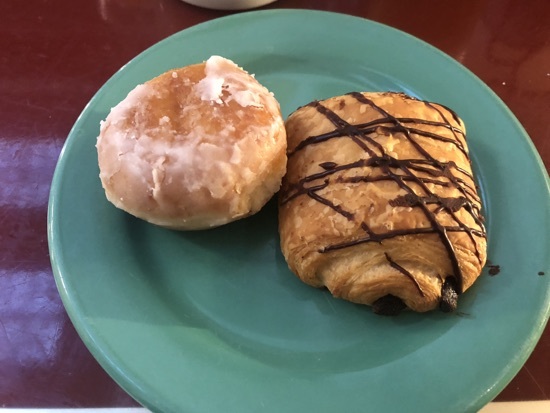 I grabbed a pain au chocolate and a donut hole. The donut was fab, it tasted so fresh. 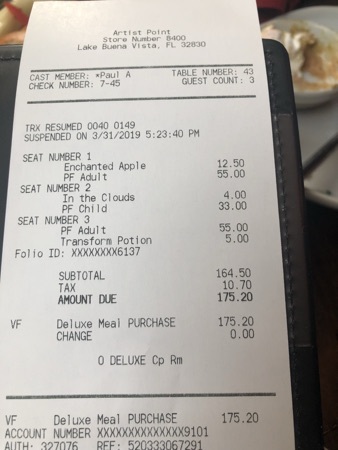 The bill came to $127.80 but we used 3 dining credits to cover this and left a tip for our server. 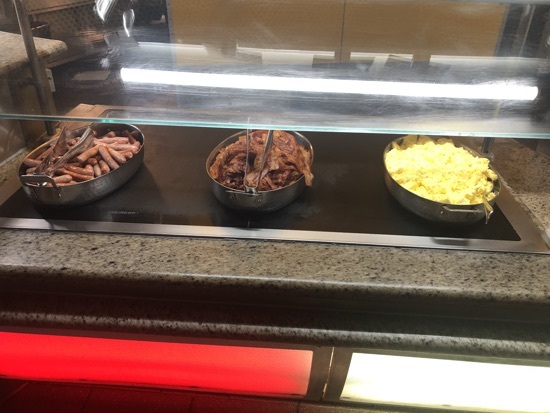 Our dinner last night and breakfast this morning has already covered the cost of the dining plan for us. 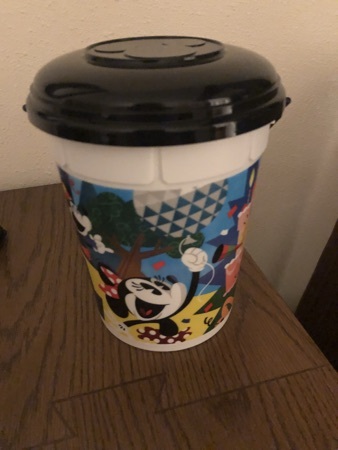 We've also got our mugs for the rest of our stay too which should have been almost $60 and still have 3 meal credits and 6 snacks to spend. We drove back to boardwalk and got changed into our swim stuff for an hour or so in Luna park pool. We were the first to arrive and as we walked into the pool area the lifeguards blew the whistle and declared the pool open. 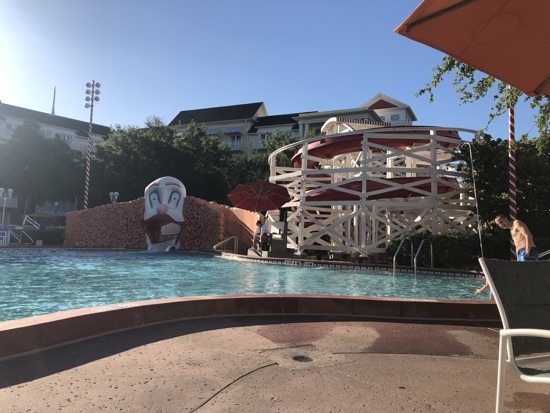 The pool area is really well themed and Dd loves the slide! We left the pool about 10.10am to give us time to pack up and check out before 11. 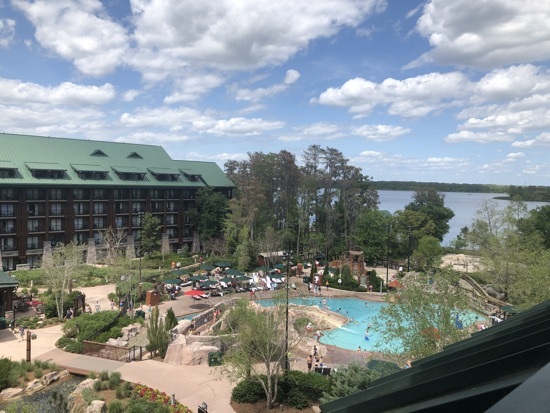 It didn't take us long and we were soon saying goodbye to the boardwalk and driving over to wilderness lodge to check in at copper creek for the next week. When we arrived our room wasn't ready so we left our luggage at Bell services and had a little look round the lobby area. I love the theming here and the lobby is so grand and impressive. 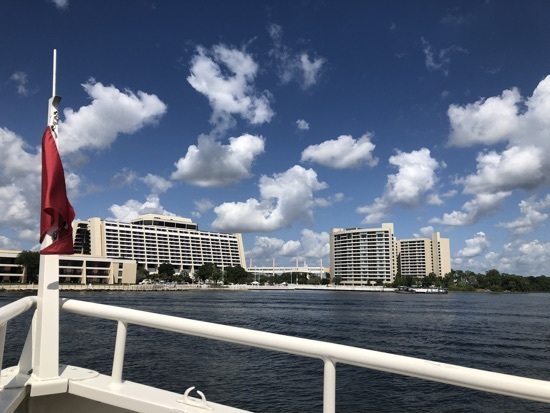 We grabbed a drink in one of our refillable mugs which we decided to keep hold of and wandered out to the boat dock to catch the boat to magic kingdom. The boat ride seems to take longer than you would expect but in reality it's probably only 10 minutes. 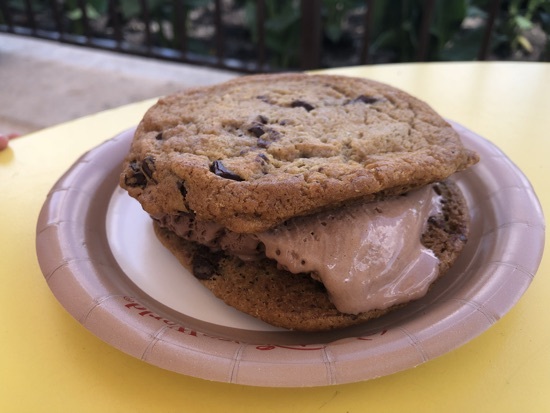 We got to magic kingdom around 12.15pm and we're 45 minutes for our seven dwarfs mine train fastpass so we called into the plaza ice cream parlour for some snacks. 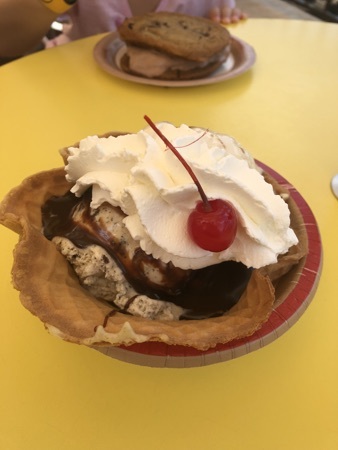 DH and I shared a plaza ice cream sundae, which was a waffle bowl with 2 types of ice cream, topped with hot fudge and whipped cream. DH picked cookies and cream ice cream and I chose the butter pecan. This was perfect shared between us and we loved it! The total for the two was around $14 but we used 2 of our snack credits. 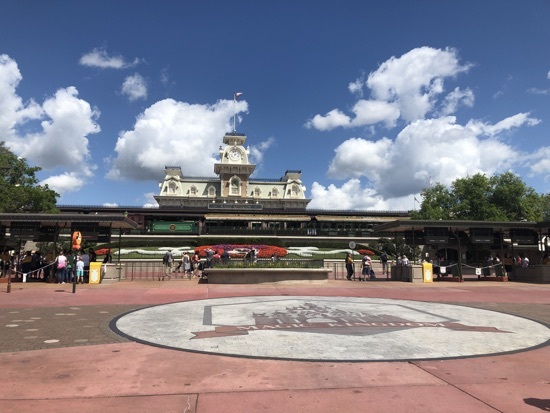 Next up we were meant to have a fastpass for big binder mountain but I didn't fancy the walk across the park, the weather is really hot today! I modified the fastpass and secured dumbo for 1.25 (the current time was 1.24), the wait time was 80 minutes which we couldn't believe! 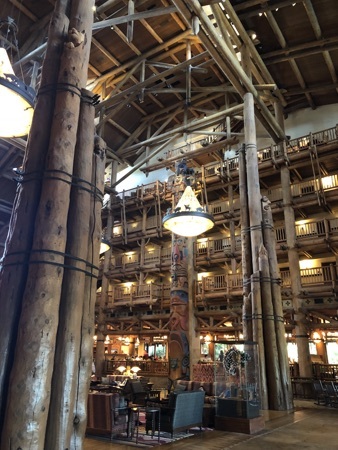 While in the queue for dumbo we got the email saying our room was ready so decided to head back to wilderness lodge. On the way out we bought a refillable pop corn bucket and fought then boat back to the resort. Our allocated room was on the 6th floor and our room is on the top floor in the sloping roof, which means instead of having bars our balcony has a solid wall which means DD can't see anything on the balcony and it feels like you are sat in a wooden box. Dd was disappointed as she can hear the pool antics but can't see them without being lifted up and I'm not able to do that at the moment. I have the front desk a ring and although they are not able to move us today but can tomorrow so we'll decide in the morning whether we want to change rooms or not. We have noticed that the enclosed balcony makes the room feel really dark and dingy as very little natural light gets in. We called bell services and 10 minutes later our luggage was being delivered. We spent a chilled hour in the room before our dinner reservation at 4.20pm at artists point for storybook dining. I was really looking forward to this! 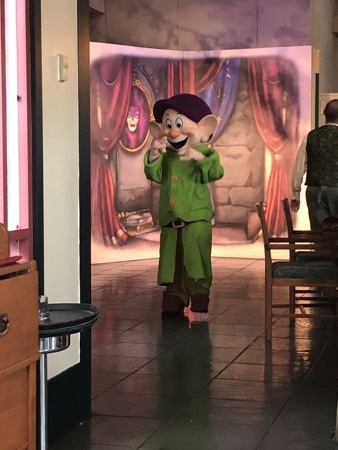 It has been 10 years since I last met Dopey and he's my absolute favourite! 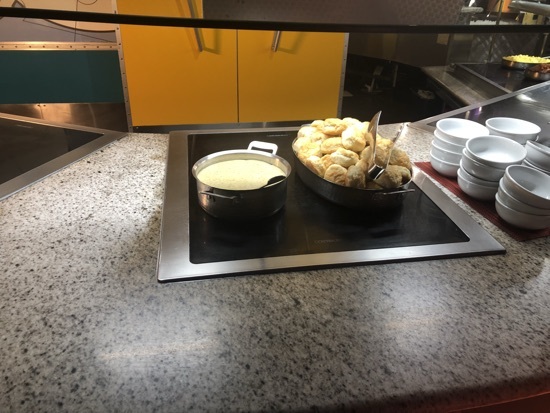 We checked in bang on 4.20pm and were told to make our way up the ramp to the restaurant and were taken immediately to our table in the corner by the window overlooking the pool. We were given the menus to look over and our server explained that all we had to do was choose a drink and an entree. 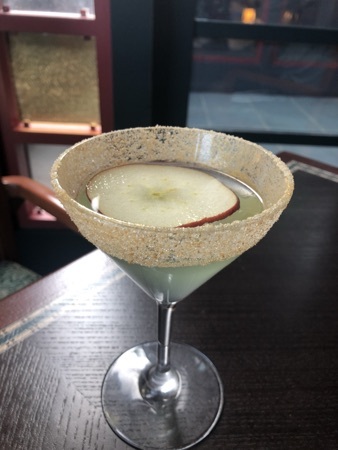 DH had the enchanted apple cocktail, this was Skyy Citrus Vodka, DeKuyper Pucker Sour Apple, and White Cranberry Juice. All the cocktails on the menu sounded really good and it was hard to choose one. 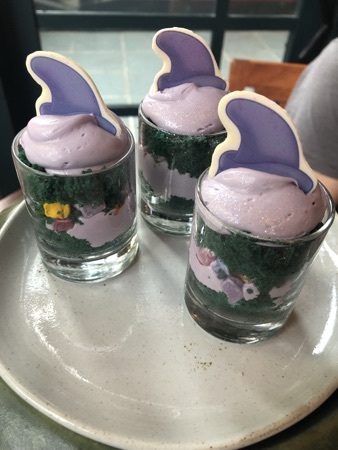 I went for the transformation potion speciality drink, it was a glass of lemonade with &lsquo;blue potion' and a blue sugar stick. 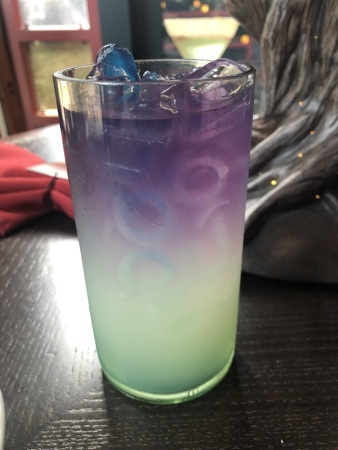 It started as pale yellow lemonade and the server added the blue potion and magically it turned purple. It just tasted of lemonade really. Dd was desperate to get her hands on the stick! 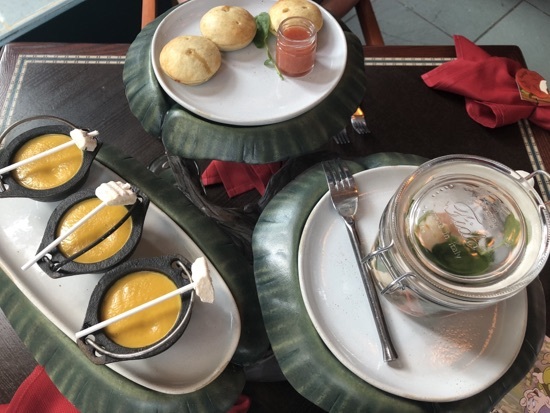 Our selection of starters arrived and were displayed on a rotating tree stand in the middle of the table. The starters were: Hunter's Pie - chicken, Black Truffle, with Stone Fruit Preserve. Wicked Shrimp Cocktail - Soy, Miso, Avocado, Thai Chili, Greens. Winter Squash Bisque - Caramel Loli, Granola. The hunters pie tasted weird to me but the other two were delicious! 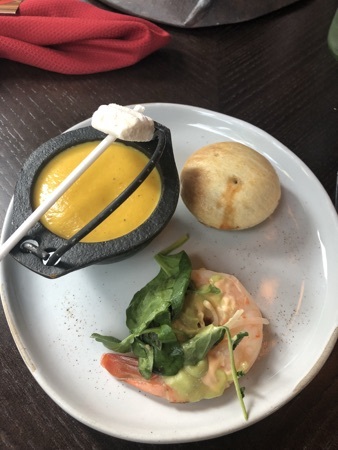 The shrimp were massive and had a lovely kick to them. The squash bisque was really tasty and I finished DD's too as she wasn't keen. 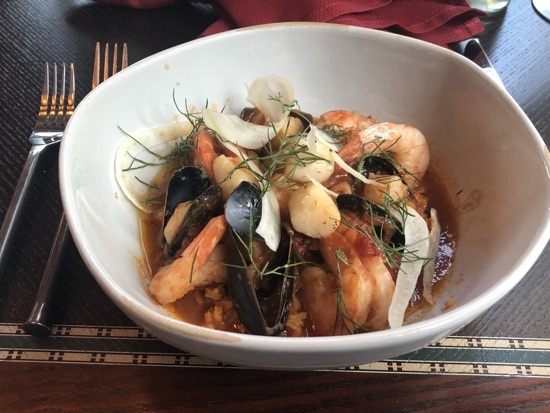 Shrimp, Bay Scallops, Mussels, Tomato, Fennel. He thought this was fine but began to wish he got the prime rib when he saw other tables with it. 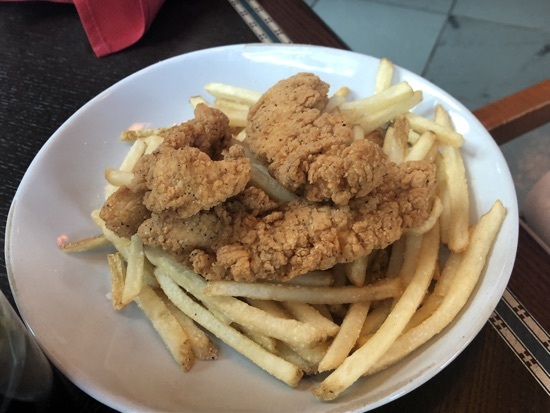 Dd had the kids chicken tenders. This was a huge portion! I helped her with some fries, they were really good! DD's entree also came with a plate of little extras, these included a small bread bun served in a plant pot, a jar of honey and butter you mixed yourself by shaking. 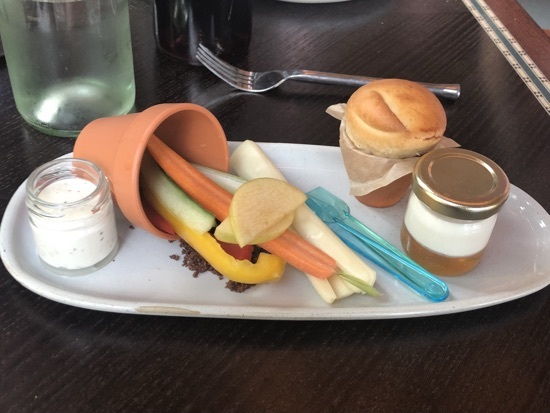 A cheese string, carrot stick, pepper sticks, grapes and apple slices and a small pot of garlic mayo. These were great at DD enjoyed it all! 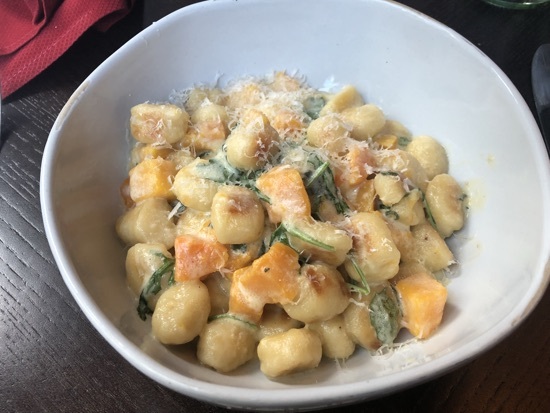 For my entree I selected A Stroll through Nature - Butternut Squash, Arugula, Gnocchi, Sage, Parmesan. I chose this to try something different, I've never tried gnocchi before but I'm not a massive fan it would seem, so stodgy and samey. The dish on the whole tasted ok but I wouldn't order it again. 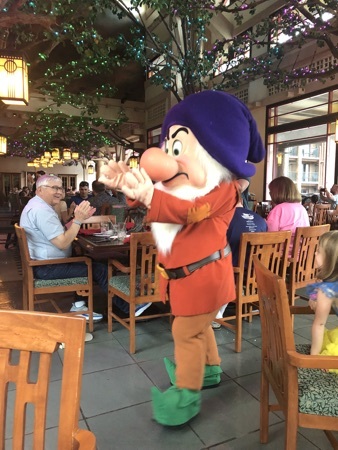 The characters came round while we were eating our starters and mains, first up was Snow White, then dopey and finally grumpy. 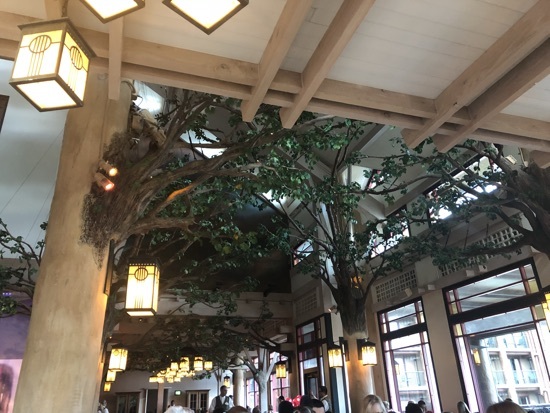 The organisation in here was really well thought through and the scenery/theming in the restaurant was really well done. Finally we were brought our desserts, again these were a trio where we had one each. Miner's Treasures - Sponge Cake, Chocolate Gems, Berry Panna Cotta. This was pretty sickly. 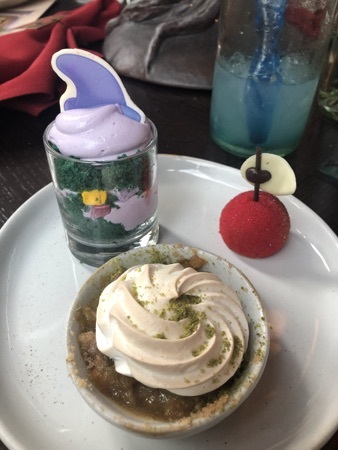 Just basically a deconstructed cupcake in a jar, looked very pretty though. Fairy Tale Gooseberry Pie - Meringue, Gooseberry. This was nice and tart, I enjoyed this. 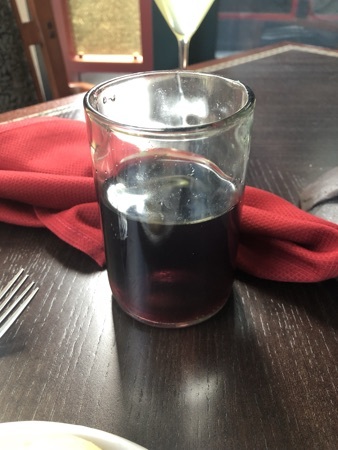 The server brought our bill over which should have been $175 but we used our final 3 credits and left a tip. 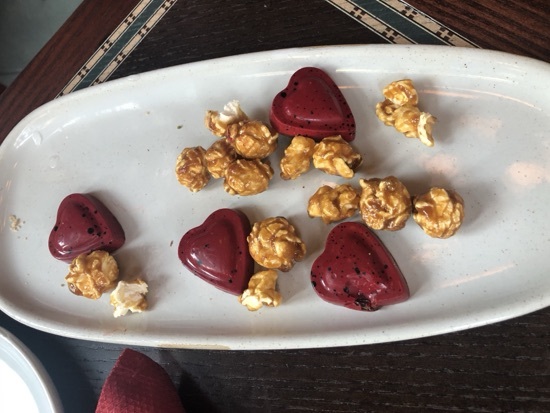 After settling up we were brought The Hunter's Gift to the Queen - Crackled Maple Popcorn and Ganache Hearts. The popcorn was abit bitter for my taste but the heart was nice, like a soft centred chocolate. 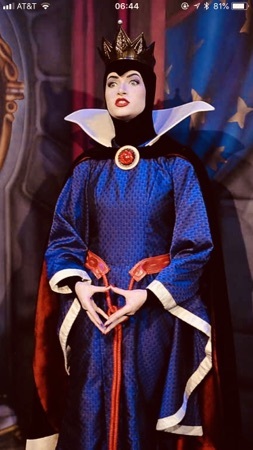 Once finished the popcorn and chocolates we headed up to see the evil queen, there was no queue by this point and she was fantastically in character. The entire meal took about an hour and a quarter and at times seems quite leisurely and others it seemed rushed. 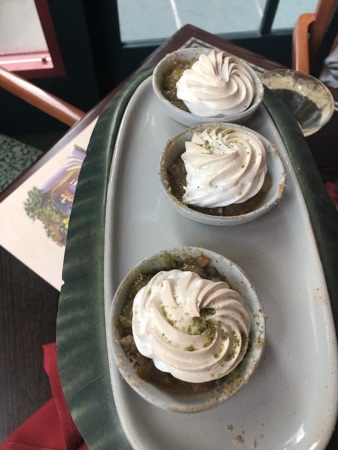 Our server was talking about bringing our desserts while I had hardly started my entree and the bill was dropped off while we were eating the first of the desserts. We decided to spend an hour chilling out in the room as we were feeling pretty full. Around 6.30 we went for a wander down towards geyser point, Outside they had marshmallow toasting over a campfire, Dd had a great time melting marshmallows, I tried one but managed to set it on fire so it tasted horrible and completely put me off  Dd was great at it and managed to melt them perfectly! The marshmallows were complementary and you could have as many as you could manage! 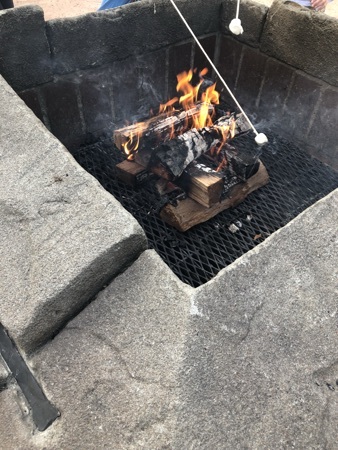 There were s'mores kits available to purchase at geyser point if you wanted to make them into s'mores. After eating as many marshmallows as she could manage we walked round to roaring fork and spent our final 3 snack credits. We picked up something each for breakfast in he morning. We made our way back upto our room about quarter past 7 and I decided that was it for me, time for me to get some sleep, the early starts had caught up with me! New Photo Added by missdopey - 1 Apr 19 11:46 AM. Some lovely photos especially the story book dining! What a fantastic day. Your food sounds amazing. A full-on brilliant day - hope you managed to get a room with a better balcony.